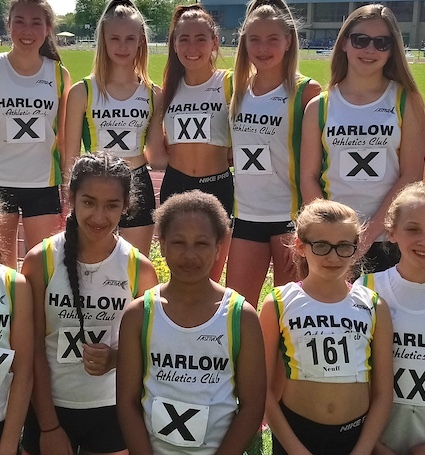 HARLOW’S young athletes ended their season with a match in the shadow of St Albans Abbey. The conditions, however, could not have been any more hellish; thirty-degree plus heat, no shade and up against three top six teams. Nevertheless the smaller than usual team managed a creditable fifth place in the circumstances. The Under 13s were most affected by absences and fielded only a single boy, James Malyon, who was fifth in the long jump. The girl’s team was a little better with six available athletes. Sophia Bridle won her 200m race and jumped a new PB in the long jump. Her jump of 4.94m will be ranked second nationally and is only two centimetres down from first. Sophia has been pushed hard all season by Rhys Cole who was second in the hundred metres and first in the B 200m. Rhys has had a good debut season with success in both sprint and middle distance events. Sophie Brennan had a fourth placed finish in the javelin and came sixth in the shot. Lucy Allen was fifth in the two B competitions for the same events. Katie Lee mixed and matched, covering events on both the track and field. She was sixth in the 800m and her time was understandably depressed as, like all competitors, she struggled with the heat. She was then sixth in the A discus event. Shannon Waterman picked up sixth and fifth places respectively for high jump and long jump. The Under 15s fared a little better in terms of turnout with four boys and seven girls available. Remarkably the boys ended their section of the match in fourth place as it seemed to be the group most globally affected by the holiday season timing of the match. Marley Sarling was third in the long jump, second in the javelin and won his 200m. He has had an excellent season and had two major targets: to make the national school’s finals and to break 24 seconds for 200m. The former he accomplished in July and the latter he achieved in this race; 23.7s will see him rise into the top fifty nationally. Elliott Butcher was fifth in the 100m in a quick time of 12.2s and in a tight, blanket finish ending. He was also persuaded to do the B long jump and finished second. And he won his B 300m. James Petty was second in the 300m before succumbing to the heat and withdrawing from his other events. Matthew Simmons completed the quartet and he was fifth in the B 100m. The girl’s covered more events and had a decent day. Annalyse Hassanally was fifth in both her 100m and 200m races. She was accompanied by Lauren Jones in the 100m and Alex Gamzekova in the 200m, both were fifth in their respective races. Lauren Jones ran well for a new PB in the 300m and was third in her race. Emily Scofield was sixth in a strong A race and also ran the 800m in which she was sixth. She was joined by Scarlett Griffin, for the first time at the distance, who was also sixth. Grace Iyinbor was the club’s only hurdler for the age group on the day and she was third. She won the javelin event with a throw of 24.14m and was fourth in the long jump anchored the relay quartet who came third. There were other good performances in the field as Abigail Dawson tied for second in the high jump. This is only her first year in the age group and she’s already jumping well. Katie Brennan was third in the A discus and this was matched by Alex Gamzekova in the B event. Gamzekova went on to throw the shot 9.44m for a new PB and third place. Meanwhile, Scarlett Griffin was fourth in the B long jump. Participation at Under 17 level was sparse for all clubs, with many events only having an A race. This was certainly the case for 100, 200 and 300m in which Breanna Philip, Mairi Malcolm and Gabrielle Bridle were sixth in respectively. Ami Ashby was third in the sprint hurdles. Grace Malcolm ran both middle distance races and was third in the 800m and fourth in the 1500m; an outstanding effort in debilitating heat. On the field Gabrielle Bridle withdrew from the high jump having turned her ankle. Her only jump at 1.35m was still good enough for fourth. In the other jumping events Breanna Philip and Grace Malcolm were both fourth in the A and B long jumps and Ami Ashby was fifth in the triple jump. Mairi Malcolm had a good day registering a new PB of 6.99m in the shot and picking up third in the B discus. Breanna Philip was fifth in the A competition. The U17 men could only muster two athletes: Benison George ran both of the shorter sprints and was fifth in both. Joe Wilkes ran the 400m and was third. He then went on to compete in the field and was fifth in the long jump and fourth in the triple jump. After the match club chair Steve Lott said; “Reflecting on the season as a whole we have to be pleased by the progress we’ve made. Today is a measure of this as we’re disappointed with a score of 260 as we’ve averaged 366 points per match for the rest of the season. However, in seasons past this would have been seen as a good score. Harlow finished twentieth of the twenty-six clubs.